Data is stored on tapes in Central Mass Storage. Fermilab stores tens of petabytes of scientific data in its mass storage system. A petatbyte of information is equal to 10^15 bytes. 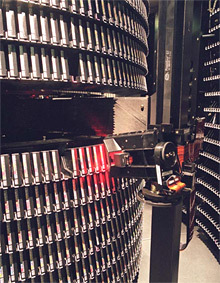 The laboratory stores data long-term using a tape storage system called Enstore. Researchers can access this data directly on-site or through disk caching software called dCache both on-site and off-site. dCache, together with Enstore, allows researchers located away from Fermilab to access the data stored on the tapes. The software works somewhat like a Web browser cache that locally saves information about sites frequently visited so that it does not need to reload that data on subsequent visits. dCache retrieves data from the tapes and can provide high-performance access to frequently accessed files. Some dCache disk storage systems at Fermilab store large amounts of data; the US CMS Tier 1 disk caching system can store 3 petabytes, and its capacity will be increased as the Large Hadron Collider comes online.